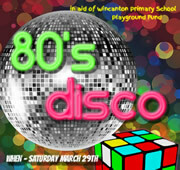 Wincanton Primary School's PAFOTS Committee is holding an 80s Disco in aid of the School Playground Fund on Saturday 29th March. Everyone is welcome, so please buy your ticket soon and support your local school! Graeme Wilson, head teacher at Wincanton Primary School, talks about their latest Ofsted report, the success of the school's teaching methods and news that the school has been recognised as one of the top 100 most improved primary schools in England. 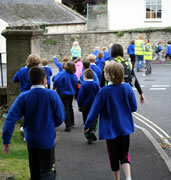 A sponsored walk organised by staff at the Wincanton Primary School and completed by their 270 pupils has raised over £2,000 for St Margaret's Hospice. Pupils were pleased and excited on receiving plants and flowers from Otter Nurseries to help them get their learning garden going. A huge crowd of well-wishers, subjects of her sovereign Majesty and wearing a wonderful collection of hats and crowns, gathered for a celebratory lunch at Wincanton Primary School on Thursday 31st May. December saw the launch of the school's new website, intended to keep parents and the local community up to date with all that goes on at the school. Children at Wincanton Primary had a close-up view of police work when the school grounds were turned into a crime scene as part of a citizenship project last week. Year 5 and 6 children started their school day as normal on Wednesday but had no idea the dummy crime scene had been set up by teachers and police officers. Did You Attend Wincanton Primary School? Deputy-Head Sarah Martin is appealing for old boys and girls of the school to share their stories, photos or artifacts with today's children. Don't miss this chance to make a real difference to Wincanton Primary School by helping Head Teacher Graeme Wilson and Deputy Sarah Martin by joining the Painting Party on Saturday 17th July. 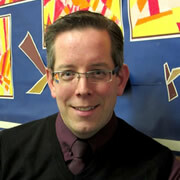 Wincanton Primary has an energetic new Headteacher. Graeme Wilson has now been in post for two terms. In this profile we explore his background and plans for the school. The Summer Fete at Wincanton Primary School this year on the 18th of June was a well attended fun affair with parents and pupils all having a good time with stalls, fancy food and exciting performances. 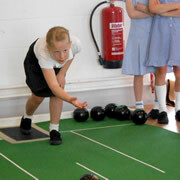 See some of the creations on show on Easter Thursday as the Key Stage 1 Pupils performed for their parents. For the last six years Christine Glen has been Head Teacher of Wincanton Primary School, but at the end of the summer term she left to join her husband in Bahrain. I would like to take this opportunity to welcome back to school our children, parents, staff and governors after the summer break and to welcome our new families that have joined us this term. The children at Wincanton Primary have been reminded that Christmas is a time to give and share as they helped pack shoebox gift boxes. Three pupils from Wincanton Primary School have won prizes and an award for their entries into art competitions.